BishopBlog: Should we ever fight lies with lies? Should we ever fight lies with lies? So here’s my moral dilemma. The pangolin is a threatened species. It is a peaceful creature which has evolved an impressive strategy of self-defence; it curls up into a scaly ball. The effectiveness of this strategy against predators can be seen here. Unfortunately, this doesn’t work when your opponent has hands, and can just pick you up. Pangolin numbers are being depleted by poachers who sell them for Chinese medicine. Pangolin scales are known as Chuan Shan Jia and are reckoned to be effective for such purposes as “expelling wind-damp from the channels”. They are also recommended for treatment of cancer, see for instance, this website. Although sterling work is being done by conservation agencies, time seems to be running out. So I wondered about taking a different tack. As Ben Goldacre has famously remarked, the Daily Mail has a mission to classify inanimate objects into those that give you cancer vs those that cause cancer, so how about getting pangolin scales on the former list? This idea has been germinating in my brain for a while, but there are two major obstacles. First, I have a reputation for truthfulness, which I’d be sorry to lose, and second, how would I start such a rumour? Well, a recent post by Jo Brodie gave me an answer for part 2. Jo noted that if you upload photos to Flickr, they get picked up by people doing Google searches. Her photos of ads for weight-loss tea, accompanied by her comments that there’s no evidence for effectiveness, have actually appeared on websites advertising the stuff. But Jo’s posts don’t involve any dishonesty. I want to spread a rumour about Chuan Shan Jia that is completely fictitious. I had some misgivings, but I did it. I opened a Flickr account and made a graph. I took a figure from a powerpoint presentation on cancer rates and doctored it to be about pangolin scales. You can see it here. [No you can't, link removed. See P.S. below!]. Whether the sort of people who use Chinese medicines will actually ever find this seems unlikely, but it seemed worth a shot. If anyone would be willing to translate the slide into Chinese, I'd be most grateful. I had a moment wondering whether I’d get sued by purveyors of Chinese medicines, but I don't think I need to worry, since the use of endangered species in medicines is illegal. So what about my reputation? Well I am hoping that I can preserve it by declaring here that you can rely on me to be honest in my science communications on all topics except use of medicines based on endangered species. If my pangolin hoax works, you can anticipate a Flickr posting on rhino horn next. My husband is very disapproving and thinks it is never right to fight lies with lies. What do others think? Well, the verdict in the comments is clear, and my husband is now feeling extremely smug. To go down this route is not just unethical but also foolish. So I won't. I had hoped that by declaring myself as a hoaxer at the same time as initiating a hoax, I could defend my integrity, but I see that this would be a dangerous assumption, and the unintended consequences could be serious. Thanks to Jo, I've discovered that my inexperience with Flickr means that my hoax graph wasn't copyable anyway. 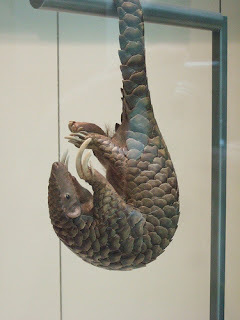 But I'm glad I posted this: very interesting and helpful to get the reactions, and Jo has given me ideas for pursuing my vendetta against pangolin medicines without any dishonesty. I also inspired a great set of tweets from @Artvanderley that demonstrate another approach: implant the idea there could be bad effects of pangolin medicine without claiming it: e.g. "40 years ago no one believed that ingesting pangolins was linked with cancer, excessive weight gain and genital atrophy". I suspect that some of you may think that even this may be sailing too close to the wind, but it's clearly far less heinous than inventing data. I'm left feeling just a bit disappointed, as I have always been very well-behaved and law-abiding and was rather enjoying my brief dalliance with hoaxing. But yes, the issues are serious, and so I will climb wearily back up on the moral high ground. I agree with your husband. It is never right to fight lies with lies. Perhaps, sometimes is more effective, but you never know for sure. So, most cases do not worth a lie. However, there are situations in which you are constrained by the context, and the only decision is about two wrong actions. For example, when you kill someone in self defense and of your family's life. It is never right to kill someone, but if you do not have another choice, and your decision is to kill or be killed along with your family (two bad things) you must choose the least wrong. In other words, if your decision is restricted only between two bad things, your duty is to choose the least wrong. A simple case is when you lie to a murderer to save the life of someone. Yes, lie is wrong, but allow the murderer to kill someone is worst. Now, the important element in this is to be sure that there is no other option. If you do something wrong level 1, to avoid something wrong level 5, but you have also the opportunity to do something right, then you are not doing the best you can. Of course, the evaluation of each situation is the problem. In sum, do you think there was no other option to fight pangolin extinction? If your answer is no, then your actions were justified. If the answer is yes, then you did something wrong without enough justification to do it. Annoyingly, fighting this kind of thing requires keeping to the moral high ground because any slip gets pounced on as discrediting the entire idea of opposing the use of pangolins this way. The only way not to slip is to be telling the truth, unfortunately. My initial reaction was negative and it has only intensified on reflection. I realise you are doing this with a twinkle in your eye (and that @Artvanderley's follow-up tweets are meant to be humorous) but — even though I think I have a decent sense of humour — it makes me distinctly uneasy. Too many people won't see the twinkle - they'll just see a scientist making stuff up and it will be difficult to argue against that view. The scientific community comes down hard on members who fabricate data and for the very good reason that this helps to ensure (though does not guarantee) the integrity of the whole enterprise. So it's an interesting experiment, perhaps, but to my mind this is completely the wrong track for a scientist to take because it risks tainting the whole profession. You only have to look at the global warming debates to see how ready people are to mis-trust scientists and how what we do is so easily mis-construed (UEA emails, anyone?). If we go down the track of deliberately using mis-information, however noble the cause, we will lose an awful lot more than the pangolin. An interesting, and rather clever, strategy but obviously a difficult one because it's putting you in a position of faking data in order to change something. In general I do like a bit of underhand sneakery but faking data might be a step too far, especially for a scientist... but moral dilemmas aside, will this actually work? (By the way at the moment your photo is 'all rights reserved' so it won't work because the photo doesn't show up in the pool of royalty free images [mine is now here http://freeimagefinder.com/pic/weight.html] - you need to change the License so that it's one of the Creative Commons ones). But who are the 'end-eyeballs' for this image? If it's someone who's thinking about buying pangolin scales off the web will they care / understand / notice what the graph is telling them? There's a possibility that my weight loss patch image will appear on a website but it really might not reduce the sale of weight loss patches so I've no way of determining its success. Other than minor failure, no real harm done. I suppose there are worse things ethically - it's not as if you're not publishing this to be part of the body of knowledge on pangolin scales and cancer but I think it has the potential to reduce trust. If we're presenting lies as data for good purposes that could fairly easily be presented (even if not done) as scientists faking data for their own benefit. I'm just a bit nervy of anything that seems like scientific fraud. Moreover, will it gel with people's 'narrative'? Presumably there are fewer pangolins and more people with cancer so I can even see people making a plausible, though entirely wrong, connection there! Maybe an alternative might be to have images that are linked to text warning people about fake pangolin scales which therefore cannot help their cancer. This sits within the narrative of pangolin scales helping in cancer but raises the worry that buying these pangolin scales will rip them off because they're fake. I'm not sure any of these strategies will work to be honest but I'd feel slightly more comfortable, ethically, with the last one because it criticises the sellers of pangolin scales but doesn't fake data. Review of "How Genes Influence Behavior "